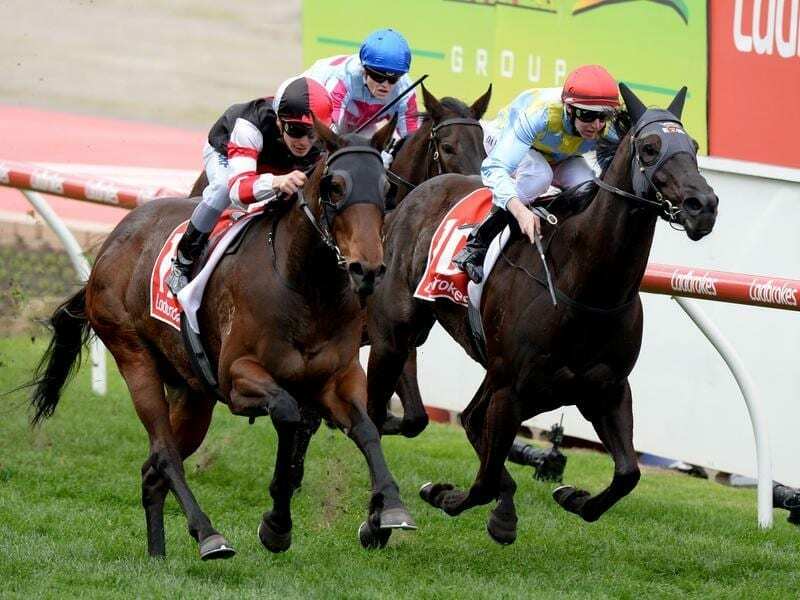 Missrock (l) will be out to cause an upset and claim her first Group One win in the Moir Stakes. Robbie Laing is thankful the Group One Moir Stakes is still four days away. The Cranbourne trainer took Group One-placed mare Missrock to Moonee Valley on Monday for a gallop ahead of Friday night’s 1000m sprint. Laing was encouraged by the work under race rider Ben Thompson but had some other concerns. Missrock was in season on Monday and with warnings against using products containing altrenogest Laing was reluctant to use Readyserve which the mare had been on to regulate her cycles. “It’s affected her now. She’s leaning up against the side of the box and has got her tail up over her back,” Laing said after her gallop. “I just don’t know what she’ll be like on the float on the way home but some mares go better when they’re in season. “A mare we had Countess Marizza won the (1981) Lightning and when she was in season she wouldn’t get beaten. With nominations extended until Tuesday morning, Missrock is one of 14 horses entered in Friday night’s sprint with 12 of those looking for their first Group One win. Brave Smash and Viddora are already winners at the highest level while others entered include Ball Of Muscle, Faatinah, Houtzen, Nature Strip, Snitty Kitty, Spright and Voodoo Lad. Laing said the barrier draw would be crucial to Friday night’s contest with Nature Strip, Houtzen, Ball Of Muscle and Snitty Kitty ensuring there should be good speed. Missrock has been placed in the past two Goodwoods in Adelaide and the mare has an excellent first-up record. “I hope they go a hundred miles an hour,” Laing said. “She won the Carlyon here over the 1000 metres, she ran third to Redkirk Warrior and Redzel in the Lightning at weight-for-age, she won at Flemington the preparation before that and her first start in a race she won at Caulfield. “So her first-up form is great.